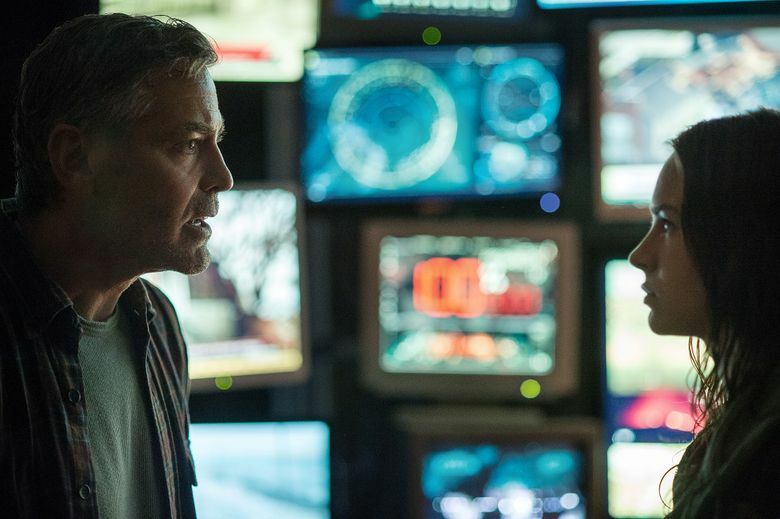 A review of the summer blockbuster “Tomorrowland,” which stars George Clooney as a disillusioned scientist who, along with a teen, gets embroiled in a time-travel adventure. Rating: 2.5 stars out of 4. “Tomorrowland,” for better or worse, feels a lot like a trip to Disneyland: dazzling at first, with its zippy sights and sounds, but eventually overwhelming, so much so that you find yourself yearning for a quiet bench, a bit of space, a moment of calm. I’m speaking, of course, as a grown-up, and mileage may vary for the kids toward which this movie is aimed: My 10-year-old assistant critic enthusiastically proclaimed “Tomorrowland” to be “a great movie” and left the theater beaming; I, in the grand grown-up critical tradition, departed feeling as if I’d been on a theme-park ride that went on too long, and that a drink might well be in order. Though it’s made with great energy and inventiveness, there’s something ultimately muddy about “Tomorrowland”; it’s as if director Brad Bird got so caught up in the sets and effects and whooshing editing that the story somehow slipped away. Essentially, it’s a family-friendly sci-fi tale in which a bright teenage girl named Casey (Britt Robertson) is given a button through which she can travel in time. Joining forces with disillusioned scientist Frank (George Clooney; the character’s also played in flashbacks as a child by Thomas Robinson) and a mysteriously intense little girl named Athena (Raffey Cassidy), she zooms off to Tomorrowland, bent on restoring optimism to the world. ‘Tomorrowland,’ with George Clooney, Hugh Laurie, Britt Robertson, Raffey Cassidy, Tim McGraw, Kathryn Hahn, Keegan-Michael Key, Thomas Robinson. Directed by Brad Bird, from a screenplay by Damon Lindelof and Bird. 124 minutes. Rated PG for sequences of sci-fi action violence and peril, thematic elements and language. Several theaters. But Clooney, despite some impressive movie-star stubble, is given little chance to demonstrate his trademark charisma (he disappears from the film for nearly an hour), and all that whooshing around in time and space gets tiring by the movie’s final third. If you can’t take your kid to Disneyland this weekend, “Tomorrowland” makes a quite serviceable two-hour substitute; just schedule a little nap time afterward, for both of you.